At a very successful open day at Dacres Wood in early September, over 30 people turned up to see the site and find out more about how they could help explore ways in which we can encourage greater access and use, whilst ensuring wildlife is protected. At the meeting we were lucky enough that someone put themselves forward to act as Chair! A bid has already been put in to Perry Vale Ward Assembly for improvements to the pond and an inaugural meeting has been arranged for Sunday 30 September. So things are happening fast! We are still keen for new people to join the group, so if you are interested, please email Lewisham’s nature conservation team who will put you in contact with the friends. 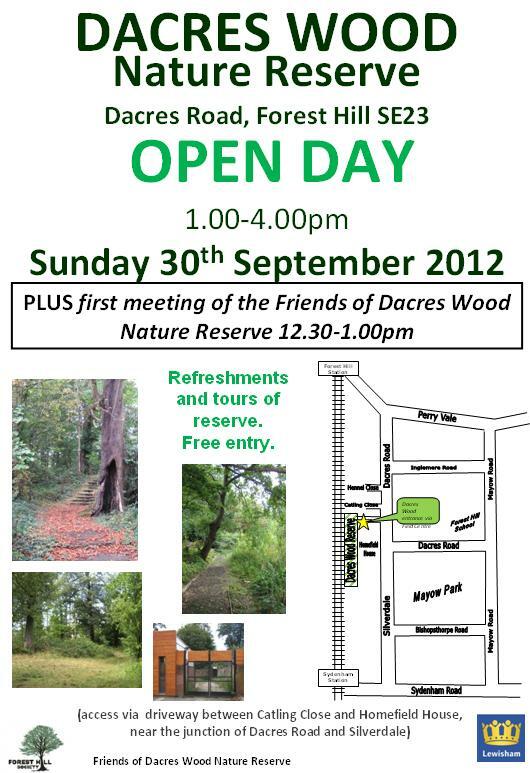 Join the Friends of Dacres Wood and the Forest Hill Society at Dacres Wood.